CD 1: Mahler: Symphony No.5 in C Sharp Minor; 4 Songs from "Des Knaben Wunderhorn"
CD 5: Mahler: Symphony No.8 in E Flat Major - "Symphony Of A Thousand"
CD 8: Beethoven: Piano Concerto No.5 in E Flat Major - "Emperor"
CD 10: Beethoven: Symphony No. 3 "Eroica"; Overture "Egmont"; Overture "Coriolan"
CD 14: Beethoven: Symphony No. 9 "Choral"
"How long had you been conducting Beethoven symphonies?" "Which of the great Beethoven conductors of your youth..."
"Did you have to teach the Chicago Symphony..."
"I wanted to ask you a question..."
"The Seventh symphony...are there special problems..."
CD 18: Elgar: Enigma Variations; Overture "Cockaigne"
CD 22: Tchaikovsky: Symphony No. 5 / Weber: Overture "Oberon"
CD 24: Tchaikovsky: Symphony No. 6 "Pathétique"
CD 39: Mahler: Symphony No.2 in C Minor - "Resurrection"
1. "The King & Queen of Hearts were seated on their throne"
3. "They told me you had been to her"
4. "She's all my fancy painted him"
5. "She's all my fancy painted her"
7. "She's all my fancy painted her"
8. "A boat 'neath a sunny sky"
CD 45: Bruckner: Symphony No.4 in E Flat Major - "Romantic"
CD 52: Prokofiev: Romeo & Juliet (Highlights); Symphony No. 1 "Classical"
CD 54: Dvorák: Symphony No.9 - "From The New World"
"For behold, darkness shall cover the earth"
"And there were shepherds abiding in the fields"
"And lo, the angel of the Lord"
"And the angel said unto them"
"And suddenly there was with the angel"
"Then shall the eyes of the blind be opened"
"All they that see Him laugh Him to scorn"
"Thy rebuke has broken His heart"
"Behold and see if there be any sorrow"
"He was cut off out of the land"
"Unto which of the angels said he at any time"
"Let all the angels of God worship Him"
CD 64: Mendelssohn: Symphony No. 3 - "Scottish" & No.4 - "Italian"
CD 66: Beethoven: Symphony No.9 in D Minor, Op.125 - "Choral"
No.9a: "Aber am ersten Tage der süssen Brot"
No.38b Chorus II: "Wahrlich, du bist auch einer von denen"
No.50a Evangelist: "Sie schrieen aber noch mehr"
No.53a Evangelist: "Da nahmen die Kriegsknechte"
"Und da sie an die Stätte kamen"
"Und von der sechsten Stunde an"
Coro: "Le rube, gli stupri"
"Noi siamo zingarelle - Di Madride noi siam mattadori"
Und Gott sprach: "Es sammle sich das Wasser"
Und Gott sprach: "Es bringe die Erde Gras hervor"
Und Gott sprach: "Es sei'n Lichter..."
In holder Anmut stehn - Der Herr ist groß...macht"
Und Gott sprach: "Es bringe die Erde hervor"
CD 100: Shostakovich: Symphony No.13 in B Flat Minor - "Babi Yar"
Das heisst ein Wort, ein Wort ein Mann! Was giebt's? Treff' dich wieder am Schlag? Blumen und Bänder seh ich dort? Das nenn' ich mir ein Abgesang! Bruckner still stand today as milestone recordings . . . Beethoven gets two full cycles of the symphonies, as well as Vladimir Ashkenazy's rolled gold performances of the five piano concertos . . . The beautifully produced box set comes with a handsome illustrated hardback book. Few conductors of our age, it seems to me, could penetrate to the heart of the score with his kind of seriousness and depth of commitment, fewer still with his ability to stretch orchestral musicians beyond their seeming capabilities, to make them share his musical vision and transmit it to the audience with startling immediacy . . . For me, it made dipping into the recordings that fill this bounteous box an endlessly rewarding stroll down memory lane . . . Surprises lurk in unexpected areas of the repertory. Solti the seasoned man of the theater brings a remarkable feel for the drama in Handel's "Messiah" and J.S. Bach's B minor Mass and "St. Matthew Passion". These remain among the finest big-orchestra, big-chorus versions of these baroque masterpieces in the catalog . . . the set is an incredible bargain even for those who already own many of these recordings. And the presentation is nothing if not deluxe. Sir Georg Solti's illustrious career took him all over the world, but nowhere was he happier than in his 22 years at the helm of the Chicago Symphony Orchestra during the Seventies and Eighties . . . there's a fine photo-filled book, making this . . . Decca box that does full justice to its contents . . . Again, a formidable bargain. There are complete Beethoven, Brahms, Bruckner and Mahler symphony cycles, and a Beethoven piano cycle with Vladimir Ashkenazy, all in excellent sound. Thirty-six composers are featured in all, including some notable Bartok, Shostakovich, and Wagner. The orchestra's precision and power are daunting . . . At its best, this is Beethoven after a fresh spring-cleaning. The same is true of Solti's Mahler. Listen to the vigour with which his new orchestra plunges into Symphony No 6 . . . His Seventh is particularly enjoyable in that respect . . . Much to enjoy, not least the brilliance of a great orchestra and the justly praised Decca Sound. Die langjährige Zusammenarbeit zwischen Sir Georg Solti und dem Chicago Symphony Orchestra zählt zu den schönsten, erfolgreichsten und künstlerisch ertragreichsten Erfolgsgeschichten im Musikbetrieb des 20. Jahrhunderts, eine beispiellose Ansammlung musikalischer Höhepunkte . . . [es ist] eigentlich egal, wo man einsteigt in diesen Riesenkonvolut von 108 CDs . . . denn es findet sich kaum eine nur gediegene Interpretation zwischen den vielen noch heute als Referenzen geltenden Topacts, und man staunt auch über die hohe aufnahmetechnische Qualität des gesamten Pakets, das Soltis präzisen Vulkanismus unvermindert druckvoll und spannungsgeladen ins eigene Wohnzimmer bläst . . . Soltis gewaltige Chicagoer Diskografie ist jedenfalls eines der stärksten Plädoyers für den schier berstenden Totalmusikers.
. . . [Decca demeure] un label d'une constante qualité. Phénomène qui se justifie d'édition en réédition, en relation directe avec son étonnant catalogue. Ce coffret de rééditions exemplaires en témoigne, soulignant la justesse d'une ligne artistique menée sur le long terme par les dirigeants du label. 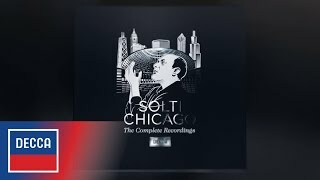 Solti & Chicago, est une équation admirablement posée par ce coffret "miraculeux" (108 cd) . . . L'entente entre le maestro et les instrumentistes de Chicago relève d'un mariage heureux voire florissant, défrichant nombre de répertoires, nombres de partitions peu jouées alors ou spectaculaires par les effectifs qui en rendent délicate leur réalisation. Comme rarement . . . l'immensité du spectre musical ainsi exploré et incarné, s'autorise bien souvent la qualité des interprètes. Quantité ne nuit pas, bien au contraire, et l'intuition acérée, féline, à la fois analytique et très nerveuse du Chef hongrois enrichit encore chacune des lectures, y compris dans le cas des compositeurs baroques ou classiques, où malgré l'absence des instruments d'époque, et de la connaissance des styles anciens, s'impose la justesse des intentions défendus. Une probité stylistique et une sincérité qui s'avèrent visionnaire ou atemporelles, en tout cas, aussi intéressantes et même plus fascinantes que bien des approches récentes, qui s'appuient sur la présence des instruments d'époque. L'instrument ne fait pas tout; il est question aussi, surtout du style, de l'intelligence d'interprétation . . . Les enregistrements sont présentés chronologiquement, avec leur pochette d'origine, idéalement contextualisés grâce à la publication préliminaire de spécialistes et proches expliquant les qualités et le travail de la direction de Sir Georg Solti . . . il existait bien une affinité magicienne entre le chef et l'orchestre américain.
. . . Solti est un cerveau qui aime les étagements démultipliés auxquels il sait réserver une attention détaillée et précise d'une indiscutable beauté sonore . . . Ainsi de 1970 à 1997, c'est presque trois décennies que Solti vit, approfondit, interroge avec "son" orchestre de Chicago dont il aura fait une phalange au retentissement artistique planétaire, ce grâce à un phénoménal appétit musical, incluant, symphonies, musiques concertantes, ballets et operas . . . le contenu du coffret DECCA en témoigne généreusement.